The purpose of the corporation of the Friends of the North Carolina Maritime Museum at Southport are as follows: to develop, encourage, and promote public awareness of the North Carolina Maritime Museum at Southport; to serve as a philanthropic organization for the support of the resources, programs and facilities of the NCMM at Southport; to render assistance as requested by the Museum; and, to acquire, hold, sell, convey, dispose, and administer real and personal estate and do any all things in furtherance of these purposes as permitted under Chapter 55A of the General Statues of North Carolina. The powers to be exercised and the purposes for which the corporation is formed shall be restricted to those allowable under Section 501(c)(3) of the Internal Revenue Code of 1986. Join the Friends of the NC Maritime Museum at Southport for a Sunset on the River fundraising event! Local area leading band, Mike’s Garage Band, will wrap up their farewell tour at this event. Bring your own lawn chair, picnic basket and dancing shoes for a fun evening on the Garrison Lawn! 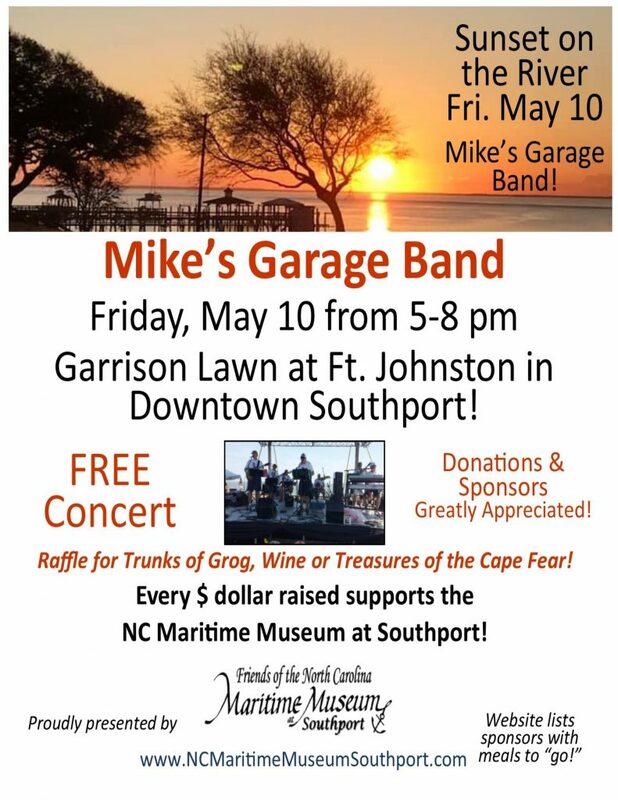 Every dollar donated or collected will go to support the NC Maritime Museum at Southport which although State sponsored, receives minimal operating funds beyond salaries. 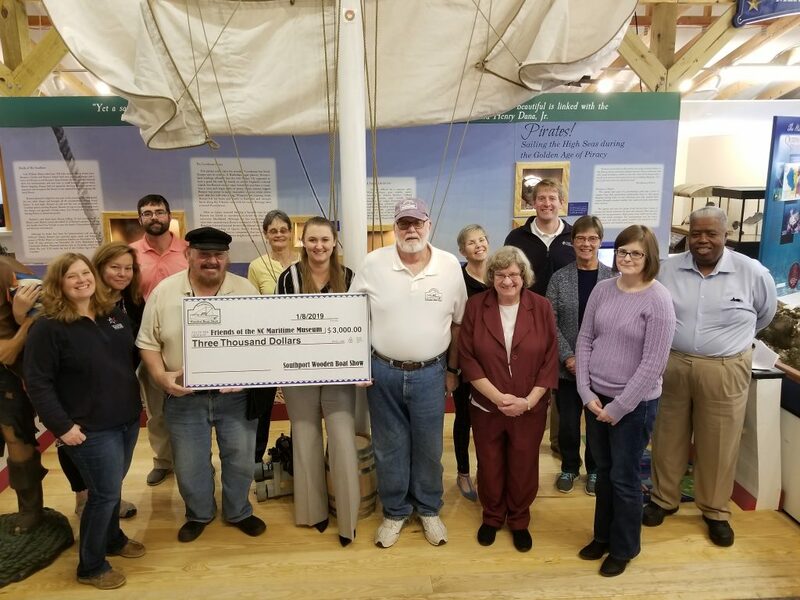 The Friends of the NC Maritime Museum at Southport raise money to maintain the facility and to expand programs and resources. Proceeds from this event will also assist with damage from Hurricane Florence. Southport Wooden Boat Show Board presenting donation to the Friends of the NC Maritime Museum at Southport. So many changes are happening at the museum that we often say, “don’t blink!” This, of course, is a good statement. As the museum evolves and changes exhibits and interpretation, more visitors arrive, school groups travel to the museum, and the curator of education has more and more outreach opportunities throughout the Lower Cape Fear. The Friends of the NC Maritime Museum at Southport is also evolving and changing. We have created a new Long-Range Planning Committee and a Media/Communications Committee to look ahead at what we can do to help the museum and to grow as a support group. We have fundraisers planned for the spring and fall, so look for more information as details unfold. This May, the museum opens its newest exhibit “The Sea Shall Not Have Them,” which interprets the Life-Saving Service, the Cutter Service, and the Lighthouse Service in our area that formed the United States Coast Guard. Thanks to many local donors, like April Potter, and entities that loaned artifacts such as Old Baldy and Smith’s Island Museum, the US Navy, and the US Coast Guard Station Oak Island for making this exhibit possible. This October we commemorate the 65th anniversary of Hurricane Hazel. There are several programs available to help you prepare for hurricane season, learn the history of the 12 most devastating storms, and what to do in the aftermath. Be sure to pick up a 2019 Calendar to stay up to day, because, as we said, “Don’t blink,” you will miss something great! 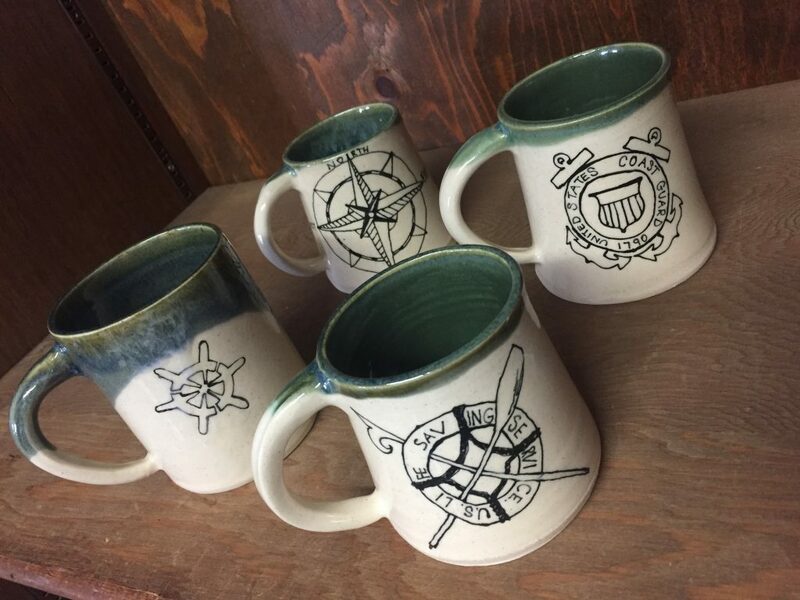 Hand crafted coffee cups from Cup Half Full! Coming to the shop soon!